There were cupcakes galore this morning at card class. Not the real ones, but paper ones. The ladies all now have a lovely stash of Birthday Cards to go to when the need arises. They were all so bright and cheery so would be perfect for the younger people in your life. And look, we even decorated the inside and the envelopes. The ladies had so much fun. There was lots of laughing, chatting and getting distracted. But in the end they all managed to produce some wonderful cards. I love being able to give these ladies some 'me' time while creating beautiful things. The Cupcake Builder Punch makes it so easy to create some cute cards. And it's great for when you don't feel like doing a lot of stamping. I teemed it up with the bright and cheery Sweet Taffy Designer Series Paper. You know when I first saw this paper I wasn't a fan. But the more I have used it, the more I have grown to love it. There is still some left on the Retiring Products List, so make sure you grab it before it is gone forever. Isn't it great to know that with just a few pieces of paper and a punch, you can make such wonderful cards. And relish in the knowledge that YOU made it. Giving a handmade card means so much more than just a Happy Birthday. It means that I care enough about you that I took the time to make something special and unique just for you. I hope you take the time to make something for someone special in your life real soon. 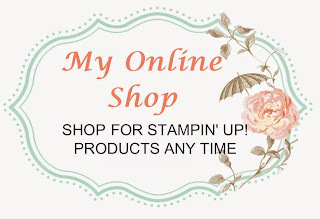 As always if you need to order anything, you can shop online in my store 24 hours a day. Or feel free to send me an email with your list or any questions you may have.